If you enter the Desert Edge Brewery at The Pub in Trolley Square from 500 East, you’ll see through a pair of double doors the untidy and cramped array of fermenters and tuns which is the playground of Head Brewer, Chris Haas. This small space is constantly churning out local favorites like the Latter Day Stout and the UPA (Utah Pale Ale). However, in three months, it’ll be gone. This summer, Haas will be coordinating the move into an entirely new brewing facility less than 100 feet away and a floor up from the current location. It sounds like a headache of stupefying proportions. The process will actually require the brewery to cut a hole in their own wall in order to move some of the bigger tanks. Fans of the Red Butte Bitter, Road Rage Rye, and other upcoming seasonals need not worry though—the brewery, but not the pub, will shut down in mid-June, but should be ready to go in the new digs by mid-August. “We’re probably getting one new fermenter,” Haas says, but the space will be able to fit more. 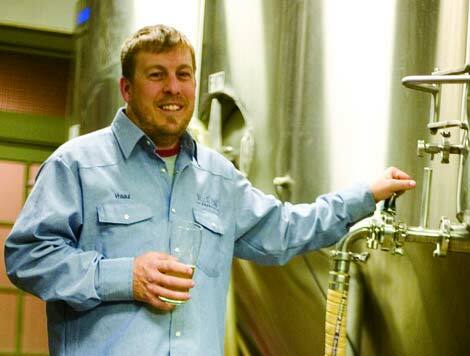 In 1996, after deciding that he wanted to brew, Haas says, “I put everything I owned in a truck and drove cross-country looking for a job,” which by chance landed him here in Salt Lake City. When he stopped in for a pint at Squatters, he talked with some of the staff and found out the brewery was hiring. Haas was working the next day and living out of his car until he could find a place. He was an assistant brewer at Squatters for three years before being interviewed and then tapped in 1999 to head the brewery and has been at Desert Edge ever since. For some, the transition isn’t coming fast enough. Last summer a rule change by the UDABC went into effect, allowing breweries all over the state to bottle and sell high-point beer on their premises. The deregulation has encouraged the release of a salvo of new products from the brewers at Wasatch and Squatters and inquiring minds would like to know if Haas wants to get in on the action. “We wanted to do some short-run bottle beer,” he says, “Four the first year, and then four the second year, one each quarter—just kind of play around a little, sell them ‘til they’re gone,” he says while remaining tight-lipped about what these specials might be. “No spoilers, but they’ll be some good beers.” Keep your lids peeled for the new stuff from Desert Edge, possibly as soon as next fall. “I love being a pub brewer,” Haas says. The business aspect of larger-scale operations forces brewers to produce in volume, working for consistency through repetition of the same beers. Working on smaller batches and constantly changing his menu allows Haas to be creative, “[As a production brewer,] I would lose my focus. It keeps my excitement going, there’s always a new beer—at least once a year I’ll do a beer I’ve never done before.” For 2008, that beer was The Radius, a golden ale in which every ingredient was from within a 150 miles of Salt Lake. “The grain was malted just over the border in Idaho, then I used local hops. My goal is to try and get local everything,” says Haas. If the move to the new brewery goes well, drinkers can expect to see the return of this experiment in late August.